With Live Dive you can mix the tracks of different patterns of a song. Each track is represented as a clip (rectangle). If you click on a clip, it will be played or stopped dependent of the current state with the next start of the pattern. The clip on the most right side affects all clips of a pattern. This is quite the basic idea like in Ableton Live. It is also possible to record all clip actions and build up a new song in an fast and easy way. Everytime the currently played pattern is going to be changed, this means the user has hit a clip and the clip is flashing, the pattern is cloned and appended to the end of the song. Another option records every played pattern, regardless if there were clip actions or not. Finally you can clone the currently played pattern and append it to the end of the song. With the Crossfader you can crossfade the volume between tracks or send tracks. 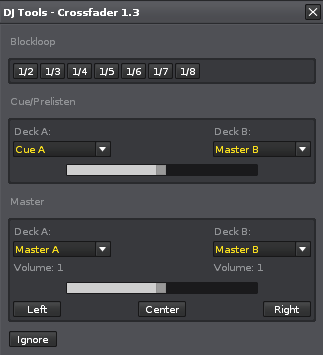 The two crossfader sliders (Master/Cue) can be controlled via Midi. When ASIO and multiple outputs are available, it is also possible to determine additional send tracks for cueing/prelistening the mixing with headphones. To achieve that, you have to set four send devices: two master and two prelistening sends. Then set per track two send devices: First the prelistening Send with "Keep source" enabled, and then as master with "Mute source" enabled.